It is important to follow your doctor's or pharmacist's instructions when taking your medicine. The instructions will normally be printed on your medicine box or bottle. Talk to your doctor or pharmacist if you are not sure how to take your medicine, or if you have any questions or concerns. You can also find extra information about giving children medicine on Medicines for children. Some medicines should be taken with food or just after food. Some should be taken on an empty stomach. It's important to follow these instructions to make sure that your medicine works well and to help protect you from unwanted effects. If the instructions say that you should take your medicine on an empty stomach, take it at least an hour before or two hours after a meal. If the instructions say to take your medicine with or just after food, a small amount of food is usually enough. It's OK to drink alcohol with some medicines (though you should stay within the low-risk alcohol drinking guidelines whether or not you are taking medication). If you are taking sedatives like diazepam (Valium), lorazepam or sleeping pills, you should avoid alcohol completely. Drinking limited alcohol is OK with most antibiotics. But with some antibiotics, like metronidazole, drinking any alcohol will make you sick. You should be careful about drinking alcohol if you are on long-term medications such as medications for epilepsy or diabetes, antidepressants, or blood thinners like warfarin. This is because alcohol can make some drugs less effective or increase the chance of side effects. See the link below for more information about medicines and alcohol. Place capsules at the front of your mouth and let them float down your throat with liquid. Place tablets on the back of your tongue and gather them with liquid or food to the back of your mouth before swallowing them. Tilt your head forward (chin to your chest) when swallowing a tablet or capsule. Tilting your head forward helps to make the pipe connecting your mouth to your stomach wider. Don't tilt your head backwards. This can make it harder to swallow as it narrows the pipe. Liquid medicine – Your medicine may also come as a liquid. Check with your pharmacist or doctor. Thick liquids – Try thicker liquids instead of water. Options are (thin to thick): milk; yoghurt; ice cream; custard; apple sauce or fruit purée; Weet-Bix or porridge. Always check with your pharmacist if you can take your medicine with food first. Crush, chop or open – You can crush or chop some tablets. You can open up some capsules and swallow the contents. Always check with your pharmacist or doctor first before you try this. You should swallow most tablets and capsules whole with a glass or water. 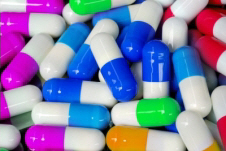 Some tablets or capsules have a special coating to release the medicine slowly. Chewing or breaking destroys this coating. If your medicine is a slow-release tablet or capsule, it is important to swallow it whole or the medicine will get into your body quickly instead of slowly. You could have more unwanted effects, or you might not have enough medicine in your body throughout the day. Drinkaware – Is it OK to drink while on medication? Information from the UK site Drinkaware about how alcohol can interfere with medication. Information about the use, storage and disposal of medicines (the link opens a PDF). Information about the safe use of medicine. Information from the US site Safe Medication with illustrations showing how to use eye, ear, and nose drops, eye ointments, inhalers, suppositories and transdermal patches. Written by Christchurch Hospital pharmacists and HealthInfo clinical advisers. Last reviewed March 2019. Images courtesy of FreeDigitalPhotos.net. Capsules by Arztsamui, Tablets by Holohololand.